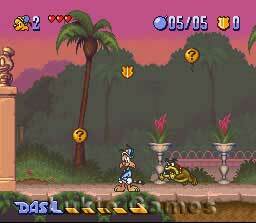 Bonkers SNES Super Nintendo Game Cartridge Cleaned Tested and Guaranteed to Work! Some unidentified thief has done what may be the most despicable crime in Toontown, they have stolen three Toondom's most priceless treasures: The Sorcerer's Hat, The Mermaid's Voice and the Magic Lamp! 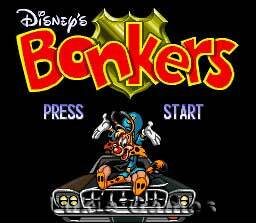 Fortunately Bonkers is now a cop, so he's on the case before you can say "sarsaparilla." Hollywood and Toontown are both turned on their respective ears as Bonkers tears through looking for clues to the mystery. His trusty friend Fall-Apart Rabbit is here to lend a hand but for Hollywood's sake let's hope the pressure doesn't cause Bonkers to fall apart. 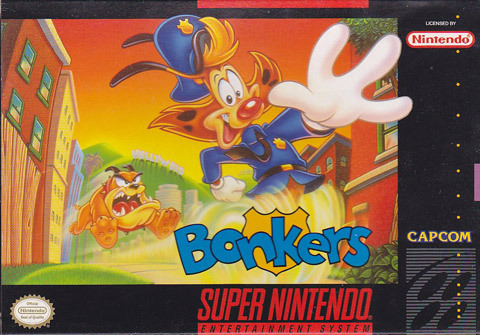 Bonkers on the SNES is a very good platform based game very much in the same vain as Tiny Toons Buster Brakes Loose on Snes. 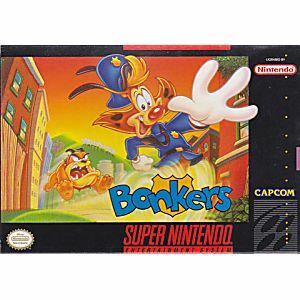 Bonkers is often a platform game on the Snes that gets over looked for more mainstream titles ie Mario,Zelda etc but trust me its a hidden classic a must for any Snes collection.